Anna Petrovna (Moscow 7 Feb 1708-Kiel 15 May 1728). She was a third child and first daughter Tsar Peter I and Catherine Alexeevna, Later Empress Catherine I. 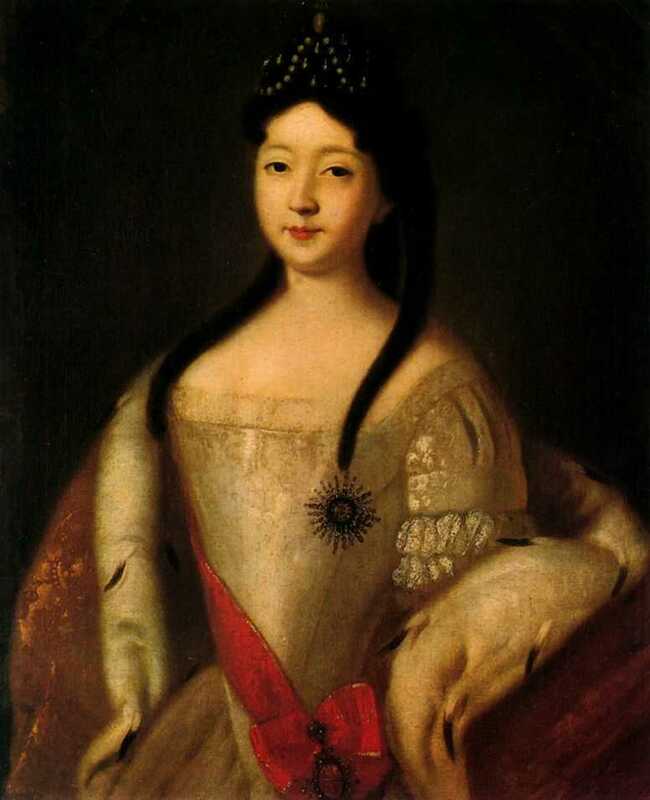 Her sister Elizabeth Petrovna was a Empress of Russia in 7 Dec 1741 - 5 Jan 1762. Anna was born out of wedlock and was legitimized on the wedding of her parents in 1712. Her perceived illegitimacy caused several projects of matrimonial alliances to be turned down. According to contemporaries, Anna strikingly resembled her famous father. She was clever and beautiful, well-educated, was fluent in German, French. Italian and Swedish. It is also known that Anna was devoted to children and took care of her nephew, Peter Alexeevich, later Emperor Peter II, when he was neglected during the reign of Catherine I. It was finally decided that Anna would marry Karl Friedrich, Duke of Holstein-Gottorp, a nephew of childless Karl XII of Sweden. Karl Friedrich was a son of Friedrich IV, Duke of Holstein-Gottorp and Hedwig Sophie Auguste Pss of Sweden. He was born in Stockholm 30 Apr 1700 year. On 17 March 1721, Karl Friedrich arrived in Russia to get acquainted with his future wife and father-in-law. He aspired to use the marriage in order to ensure Russia's support for his plans of retrieving Schleswig from Denmark. He also entertained hopes of being backed up by Russia in his claims to the Swedish throne. Under the terms of the Treaty of Nystad Russia promised not to interfere in the internal affairs of Sweden, so his hopes proved ill-founded. Another possible candidate as a husband was a grandson of Louis XIV of France; Louis d’Orleans, Duke of Orleans - the son of the Regent of France for the infant Louis XV of France and also the grandson of Madam de Montespan. The marriages proposal was later ignored due to a difference in style of address. Anne was addressed as Her Imperial Highness and Louis was as His Serene Highness. On 22 November 1724, the marriage contract was signed. By this contract, Anna and Karl Friedrich renounced all rights and claims to the crown of the Russian Empire on behalf of themselves and their descendants. As a result of this clause, the Emperor secured the right to name any of his descendants as his successor on the Russian throne, while the Duke undertook to execute the imperial will without any preconditions. A few months thereafter, by January 1725, Peter the Great fell mortally ill. As the story goes, on his deathbed he managed to spell the words: to give all..., but could not continue further and sent for Anna to dictate his last will to her. By the time the princess arrived, the Emperor could not pronounce a single word. Based on the story, some historians speculated that Peter's wish was to leave the throne to Anna, but this seems to be doubtful. The Karl and Anna was marry after Peter's death, on 21 May 1725, in Trinity Church, Saint Petersburg. The Duke was admitted into the newly-established Supreme Secret Council and exerted a moderate influence on Russian politics. Catherine I's death in 1727 made his position precarious, as the power shifted to the hands of Alexander Menshikov, who aspired to marry the young emperor, Peter II, to his own daughter. A quarrel between the Duke and Menshikov resulted in the former's withdrawing to Holstein on 25 July 1727. It was here that Anna died on 4 March 1728, within several days after giving birth to son, Karl Peter Ulrich. She had barely turned 20 years old. 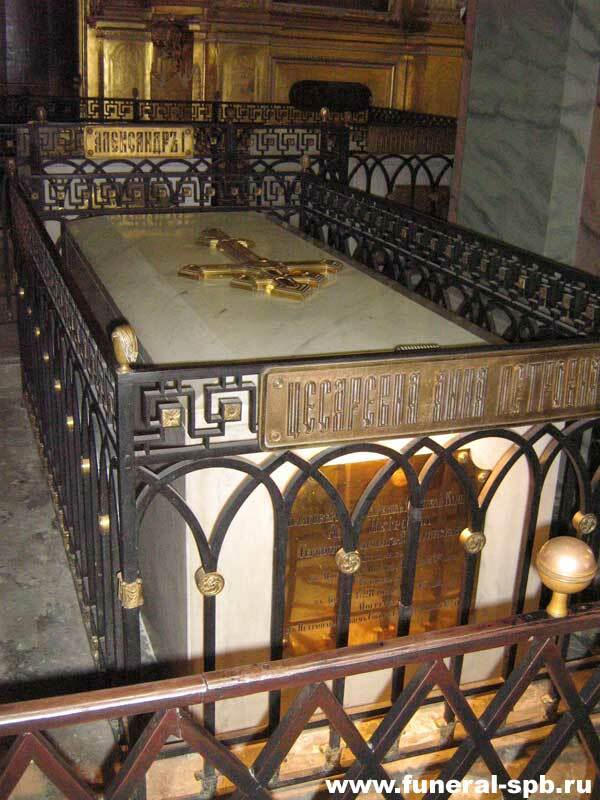 Before her death, Anna asked to be buried in Russia, near the tombs of her parents in the Peter and Paul Cathedral. Her last will was executed on 12 November the same year. Peter, the future Emperor of Russia and progenitor of all the 19th-century Romanovs. The Order of St. Anna or "Order of Saint Ann" was a Holstein and then Russian order of chivalry established by Anna's husband on 14 February, 1735, in honour of Anna. The motto of the Order was "Amantibus Justitiam, Pietatem, Fidem" ("To those who love justice, piety, and fidelity"). Its festival day was 3 February. Portrait of Grand Duchesses Anna Petrovna and Elizabeth Petrovna. Louis Caravaque, 1717. Portrait of Tsesarevna Anna Petrovna. Louis Caravaque, 1725 (before wedding). Were there any other candidates other that Holstein-Gottorp or d'Orleans? Yes. Luis, infant of Spain, later King Luis Felipe; Friedrich Wilhelm of Prussia, later King Friedrich II "the Great". nice pics, in my opinion she wasn't a beautiful lady, but it doesn't care. The image is from the 1840s. Look at the dress-style. I think Peter may well have wanted to leave the throne temporarily to Anna (as regent, at least) until she had a child. In 1724, Anna was very hurriedly betrothed to Charles Frederick, duke of Holstein, immediately after the tsar learnt that his wife (and anointed heir) Catherine had been carrying on with Willem Mons. Fearing for the future of the dynasty and the fate of his great legacy, Peter tore up his will in favour of Catherine and ordered his vice-chancellor, Heinrich Johann Friedrich Ostermann, to come to an agreement with Holstein on behalf of Anna. After previouslly dragging on for several years, the negotiations were now wrapped up in a matter of days, and the couple were engaged on 24 October 1724. The marriage contract contained a secret protocol that any boy was to be given to Peter as the heir to the Russian throne (having excluded Catherine from the succession, the tsar was determined to secure the throne and the future of Russia). His plan would have worked had he lived until 21 February 1728, when Anna gave birth to a boy, who was named Charles Peter Ulrich. But the emperor was not fated to see this happy day, dying in terrible physical pain on the night of 28 January 1725 - and, as we have seen, not making his final succession wishes clear. He spent his final hours anxiously praying and angrily waving away anyone approaching his bedside: "Later! Later! I will decide everything later!" He died and was, of course, succeeded by Catherine. She held a magnificent wedding for her daughter, and the couple spent the next two years at the Russian court. But after Catherine died in May 1727, Prince Alexander Menshikov – the power behind the throne under the new emperor, Peter II – more or less expelled Anna and her husband from Russia. Before her departure for Holstein, Anna Petrovna was asked to sign a receipt for all the money awarded to her as her dowry. For a long time, the document was not accepted by the Russian authorities, because it gave the old title of Peter’s daughter – "crown princess of Russia." Now, she was neither Russian nor a crown princess. Anna and Charles Frederick arrived in Kiel, where the duke underwent an instant personality change. Merry and gallant in St Petersburg, he was now a rude, drunken boor. He spent his time in the rowdy company of friends and other women, leaving his wife, now pregnant, entirely on her own. Surrounded by love and attention from the day she was born, Anna was unaccustomed to such treatment. She spent her days writing long, tearful letters to her sister Elizabeth. In one such letter, she writes: "Not a day passes without my weeping for you, my dear sister!" On 21 February 1728, Anna gave birth to a son. A few days later, she caught puerperal fever and died at the age of only twenty. But even more tragically, in my opinion, neither the reigning emperor Peter II nor even her sister Elizabeth attended her funeral on 12 November 1728 in St Petersburg, where she had asked to be buried. The autumn hunting season had begun, and Elizabeth was too busy riding to hounds in the fields outside Moscow! As we now know, Anna's son Charles Peter Ulrich did become emperor, succeeding Elizabeth Petrovna as Peter III. This is very interesting to read.Not much is known about her life....Didn't know that she was hurried to marry Duke von Holstein-Gottorp because of succession reasons and didn't even know they lived in Russia for some years.Thank you for this! Anna was specially raised and educated with the idea of marrying her to a European prince, all part and parcel of Peter's foreign policy and general "Drang nach Westen." She spoke four foreign languages – French, German, Italian and Swedish. In the end, she went to Duke Charles Frederick of Holstein-Gottorp, who wanted Peter the Great to help him win Schleswig back from Denmark and support his claim to the Swedish throne (even though, as pointed out above, the Treaty of Nystad expressly forbade Russia from interfering in Sweden's internal affairs). The couple were married at the Trinity Cathedral in St Petersburg on 21 May 1725 (the first knights of St Alexander Nevsky were awarded their orders in a parallel ceremony). The wedding party then crossed the River Neva to the Summer Garden, where Mikhail Zemtsov had designed a special banqueting hall for the occasion. The tables were set with all sorts of delicacies, including enormous pies. When the orchestra began to play, male and female dwarves jumped out of the pies and began to dance on the tables. Each toast was accompanied by cannon fire from a nearby yacht and the guards regiments positioned on Tsaritsyn Meadow. The following day, the festivities continued at Peterhof, where the empress awarded the new Order of St Catherine (established by Peter the Great for women in honour of his wife's courage during the disastrous Pruth campaign, when she had sold all her jewels to bribe the Turks and gain more favourable peace terms) for the very first time. Whether confused or just generous I do not know, but Catherine also awarded the order to several men as well (none of whom dared refuse)! Regarding Peterhof, when the imperial court was in residence there, Anna and her husband stayed in Marly. They once arrived to find that the palace had already been taken over by Prince Alexander Menshikov and his servants (Menshikov had opposed Anna's marriage to Charles Frederick, fearing that the duke would wield undue influence over his mother-in-law). There was a confrontation between the two groups, Charles and Anna stood their ground, and Menshikov was forced to back down and move out. Sorry to ask,but what is Marly?A name of the palace where they lived? Yes, although it certainly is not a palace in the way that Rastrelli's Grand Palace is. But it was indeed originally called the "Palace between the Ponds," because it was built between a large pond and smaller fishponds. The nearby artificial hill which runs along the seashore was built from the earth removed when the ponds were dug. This modest building was later known as Marly after an equally small and cosy French palace in Versailles – the Château de Marly. The fishpools were created by Peter the Great in imitation of the ponds at Izmailovo near Moscow, where fish had been taught to swim to the surface at the sound of a silver bell. In 1724, Peter introduced fish at Peterhof, and ordered "a bell to be made and hung by the chambers, and the fish to be trained to eat baked bread when it rang." This custom continued under Catherine the Great, who enjoyed fishing with her courtiers – an activity that often ended with them splashing one another in the fountains. In 1774, "Her Majesty so desired to sit down at the pond and feed the fish. She ordered rye bread and salt to be served in slices to feed the fish and, on being given the aforementioned bread, Her Majesty so desired to eat it herself, as did the ladies and gentlemen of the court." Marly was built between 1720 and 1723 by Johann Friedrich Braunstein, a student of Andreas Schlüter whom he had had invited to Russia in 1713. Braunstein initially worked for Schlüter as a draughtsman, on an annual salary of twenty roubles, before accepting the task of continuing his work after his death in 1714. Braunstein also worked at Tsarskoe Selo (palace of Catherine Alexeyevna), Oranienbaum and Kronstadt (palaces of Prince Alexander Menshikov and Count Burkhard Christoph von Münnich). In Peterhof, he laid out the Upper Gardens and the Lower Park and built the Grand (Upper) Palace, Monplaisir, Orangery, Marly, Hermitage and the Sun Fountain. In 1725, he was punished for a professional misdemeanour – miscalculating the arches of a structure in Kronstadt, which subsequently collapsed. He was fined the enormous sum of 1,400 roubles and all work on Peterhof was handed over to Mikhail Zemtsov. In 1728, when construction work in St Petersburg had virtually ground to a halt following the deaths of both Peter and Catherine, he was dismissed and returned to Germany. Peter's favourite residence at Peterhof was Monplaisir, which is right on the seashore, and Catherine also stayed there when she reigned after his death. So Anna Petrovna and her husband stayed at Marly, where they were joined by her sister, Elizabeth Petrovna. Thank you so much for this.I even visited this palace few years ago,but couldn't remember the name...Do you know where they stayed or what was their residence in Kiel?A palace or a modest house? She was the 4th child after Peter, Paul and Catherine who died. She was married to Charles Frederick who was heir to the throne of Sweden, though he was cheated out of it in the end. He left with her and went back to Germany because Menshikov forced him out after Catherine died. Her sister Elizabeth was to marry a French nobleman but did not in the end. When Ann took over she could not marry and when she took over in a coup then marrying would mean giving up power.